Near the junction of I-55 and I-294 is the mountain biking Mecca for the Chicago area—Palos Forest Preserve. Well, technically it’s several forest preserves that are part of the Cook County Forest Preserve system, but to anyone who enjoys riding off-road, you only need to know one word: Palos. The trail system in the preserve features nine trails of varying degrees of difficulty, with plenty of singletrack mixed in with some multi-track roads. With crushed limestone making up the vast majority of Chicago-area trails, this is the one place to truly take advantage of actual mountain biking just a 30-minute ride from downtown—at least when there’s no traffic early mornings on the weekends. This is also as close as we get to the “mountain” in mountain biking. While those in states with actual mountains may rightly scoff at that notion, Palos does offer plenty of hills to test the mettle of those who do most of their training on the Lakefront. And several challenging switchback climbs would be difficult for any rider. Singletrack in Chicago. 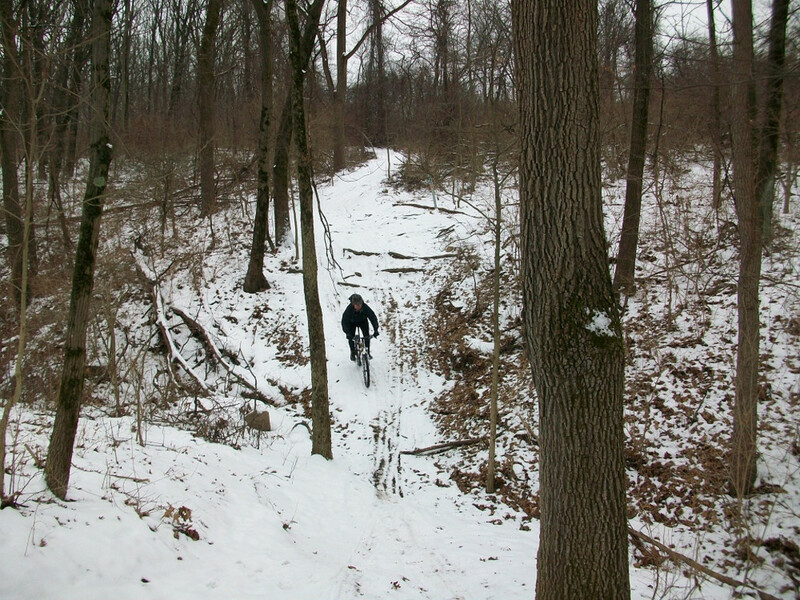 Chicago mountain bikers have fought hard for decades to keep Palos singletrack open for cyclists. Organizations like the Chicago Area Mountain Bikers have helped with trail maintenance and education to make sure cyclists are riding responsibly. The result is a trail system unlike any other in the area—a natural retreat that offers a something unique in the area. The yellow trail is the longest at 8.3 miles, which offers a big loop in the middle of the preserve and is about a 50/50 mix of singletrack and multiuse road. You can start at the mountain bike staging area at Grove 2 in Pulaski Woods. (Use the map produced by CAMBR here, it’s much better than the one produced by the forest preserve). The more fun singletrack section includes the Bullwhip switchback and view of Maple Lake and Long John Slough. The 6.3 mile Orange West Trail is nearly all single track, with some excellent sections through Three Ravines and the Psycho Path, which gives you an idea of what to expect. But that’s not to say that all of the trails are for experts. The Blue North (1.2 miles) and Blue South (2.9 miles) offer some great stretches that are more moderate. And there’s plenty of trails with no singletrack to get a taste of off-road riding. If you’ve never taken your mountain bike off-road before, this is the best place to do it in the Chicago area. All but the most experienced riders will be tested by the difficulty of at least some of the trails. Anyone who loves mountain biking, but particularly riders who are looking for a challenge. You’ll definitely improve your bike handling skills riding at Palos. Parking at the Palos Forest Preserve is easy. 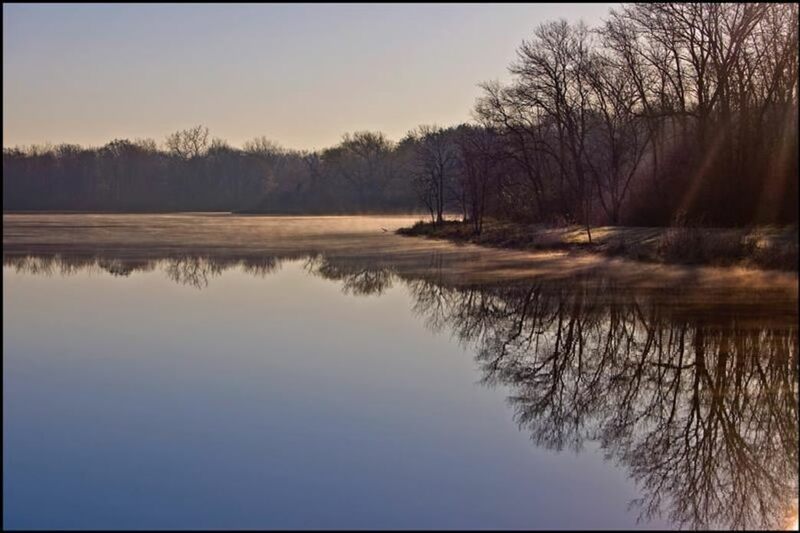 Cook County Forest Preserve Hours are from sunrise to sunset. You can find trails all over the park, but the mountain bike staging area is in the center of the park, which offers great access to several trails. Take Archer Avenue to Pulaski Woods and look for signs to Grove 2.